Ferreting involves sending ferrets into rabbit warrens to drive the rabbits outside. Nets are placed over the rabbit holes to catch them when they come out into the open. Small dogs and falcons are sometimes used instead of ferrets. Ferreting is a field sport, which means that the rabbits are chased within in their natural environment (rather than in a tight space that restricts their movements). This gives them slight opportunities to escape the ferrets. Although it is a form of hunting, ferreting is not as inhumane as other forms of rabbit hunting, which include gassing and poisoning. The rabbits that are caught don't endure anything like as much suffering as the foxes that are hunted in fox hunts. The rabbits that do come to the surface are usually killed as quickly as possible to reduce suffering - often through dislocation of the neck - and there is no blood involved in this. They are then usually handed to a local butcher, who can sell the meat (hence the need for blood to not be involved). There are no chemicals involved, so other animals are not affected. The rabbits that escape are left alone. In rural areas, rabbits are seen as natural pests. They are estimated to cost the agricultural industry millions of pounds each year by eating plants and the bark of new trees that are planted as part of new forest schemes. Obviously, ferrets are the most important thing. Aside from them, you'll also need boxes, nets, gloves (for safety purposes), loppers (to cut away undergrowth that may be restricting visibility and ease of access), and a rake (to get rid of leaves that may be blocking the rabbit's bolt holes from which they can escape unnoticed). 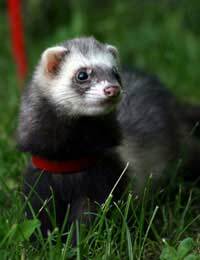 Like all domesticated animals, ferrets must be given food and water on a daily basis. They live in large ferret hutches (similar to a rabbit hutch). Because it will usually be located outside, it should be felted and sealed to keep the ferrets warm and dry when it rains. The hutches are usually kept under a cover. The front flaps are usually brought down during the night, and can be used to cover the ferrets if it's too sunny or too wet. They need to be cleaned out at least once a day, and their dirty sawdust will need replacing. Giving the entire hutch a thorough clean is recommended at least once a week. Water containers must be filled up at least once a day, and refilled with clean (preferably fresh) water when empty. Food containers are best washed after each meal. Feeding them twice a day (morning and evening is usually sufficient). In terms of what to feed them, you can buy pet food for ferrets, in the same way that you can buy cat and dog feed. They can also be fed chicken, turkey and diluted milk (avoid pure milk as it can give them diarrhoea and make them fat) as treats, but this will probably be too rich for everyday consumption. Liver, hearts and red meat are big no-go areas, as they can result in paralysis. Chocolate is another bad idea, as the theobromine found in it can kill ferrets. As a general rule of thumb, avoid sweet treats full stop. If rabbits are ruining your garden, ferreting is an option for removing them, but you'll need to know where their warren is in order to send ferrets underground to flush them out. Bear in mind that many rabbits do escape, so it's not guaranteed to get rid of all of them.